1. A medium-sized business is researching available options for connecting to the Internet. The company is looking for a high speed option with dedicated, symmetric access. Which connection type should the company choose? 2. What is the purpose of having a converged network? 3. What characteristic of a network enables it to quickly grow to support new users and applications without impacting the performance of the service being delivered to existing users? 4. Which connection provides a secure CLI session with encryption to a Cisco switch? 5. A network technician is attempting to configure an interface by entering the following command: SanJose(config)# ip address 192.168.2.1 255.255.255.0. The command is rejected by the device. What is the reason for this? 6. After several configuration changes are made to a router, the copy running-configuration startup-configuration command is issued. Where will the changes be stored? 7. Refer to the exhibit. From global configuration mode, an administrator is attempting to create a message-of-the-day banner by using the command banner motd V Authorized access only! Violators will be prosecuted! V When users log in using Telnet, the banner does not appear correctly. What is the problem? The banner message is too long. The symbol “!” signals the end of a banner message. Message-of-the-day banners will only appear when a user logs in through the console port. It is designed as a security protocol to protect switch ports. It is a special interface that allows connectivity by different types of media. It is required to allow connectivity by any device at any location. What is the technician configuring? 10. In computer communication, what is the purpose of message encoding? 11. What protocol is responsible for controlling the size of segments and the rate at which segments are exchanged between a web client and a web server? 13. What is the process of dividing a data stream into smaller pieces before transmission? 14. When IPv4 addressing is manually configured on a web server, which property of the IPv4 configuration identifies the network and host portion for an IPv4 address? 17. Which type of UTP cable is used to connect a PC to a switch port? 18. What is a characteristic of the LLC sublayer? 20. What will a host on an Ethernet network do if it receives a frame with a destination MAC address that does not match its own MAC address? 23. Refer to the exhibit. If host A sends an IP packet to host B, what will the destination address be in the frame when it leaves host A? 25. What information is added during encapsulation at OSI Layer 3? 27. Refer to the exhibit. The network administrator for a small advertising company has chosen to use the 192.168.5.96/27 network for internal LAN addressing. As shown in the exhibit, a static IP address is assigned to the company web server. However, the web server cannot access the Internet. The administrator verifies that local workstations with IP addresses that are assigned by a DHCP server can access the Internet, and the web server is able to ping local workstations. Which component is incorrectly configured? 28. Why does a Layer 3 device perform the ANDing process on a destination IP address and subnet mask? 31. What type of IPv6 address is FE80::1? The average transmission time between the two hosts is 2 milliseconds. 33. 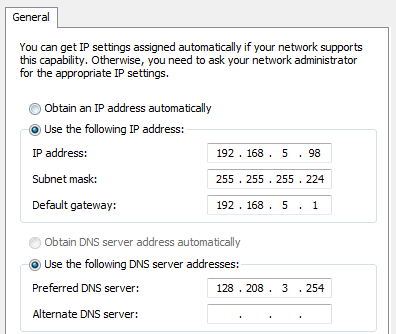 Which subnet would include the address 192.168.1.96 as a usable host address? 34. How many hosts are addressable on a network that has a mask of 255.255.255.248? 35. Which statement is true about variable-length subnet masking? 36. Refer to the exhibit. Consider the IP address of 192.168.10.0/24 that has been assigned to a high school building. The largest network in this building has 100 devices. If 192.168.10.0 is the network number for the largest network, what would be the network number for the next largest network, which has 40 devices? 38. What important information is added to the TCP/IP transport layer header to ensure communication and connectivity with a remote network device? 39. What is the TCP mechanism used in congestion avoidance? 44. What is the function of the HTTP GET message? 45. A wireless host needs to request an IP address. What protocol would be used to process the request? 46. When planning for network growth, where in the network should packet captures take place to assess network traffic? 47. When applied to a router, which command would help mitigate brute-force password attacks against the router? 48. Refer to the exhibit. An administrator is testing connectivity to a remote device with the IP address 10.1.1.1. What does the output of this command indicate? Connectivity to the remote device was successful. A ping packet is being blocked by a security device along the path. The connection timed out while waiting for a reply from the remote device. 49. A user is unable to reach the web site when typing http://www.cisco.com in a web browser, but can reach the same site by typing http://72.163.4.161. What is the issue? 50. What source IP address does a router use by default when the traceroute command is issued? 53. Match the situation with the appropriate use of network media.